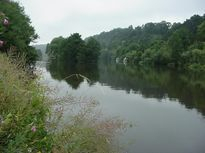 Before you leave home, check the river conditions by visiting these useful Environment Agency web sites. Telemetry data Graphs showing the water clarity, oxygen levels and temperature over the last seven days. River levels Graphs showing the Thames river levels at many points between Hurley and Teddington over the last 48 hours. General rules applicable to all TVAA fisheries. 1 - All fish are to be returned. 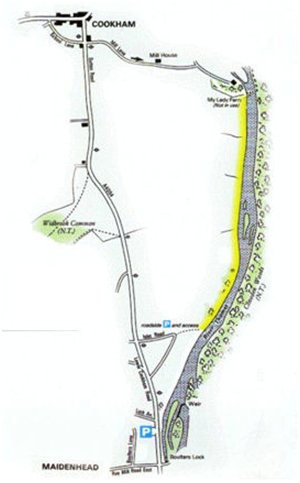 3 - No cutting of trees or bank side vegetation. 4 - No bonfires or barbeques. 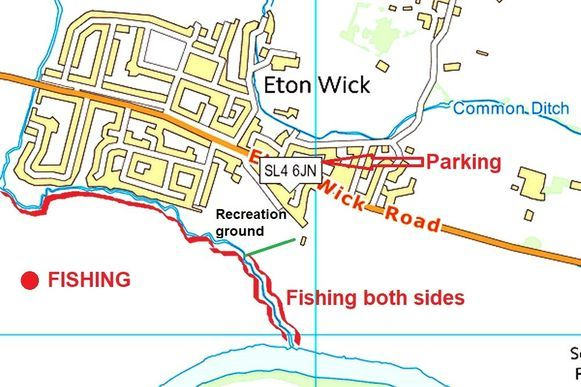 5 - Anglers must be in possession of a current Environment Agency rod licence and abide by all EA Bye-laws. 6 - Two rods maximum to be in use at any one time. Also see Fishery Specific Rules listed next to fishery maps. To prevent the spread of fish diseases, non-native fish and water organisms all anglers are requested to abide by the `Check, Clean, Dry` campaign. See the NNSS web site for more information www.nonnativespecies.org or download this information sheet Bio-security for Anglers . Occasionally TVAA waters may be closed for a match or maintenance work. See above for closure dates. To book a match telephone 0843 512 1066. 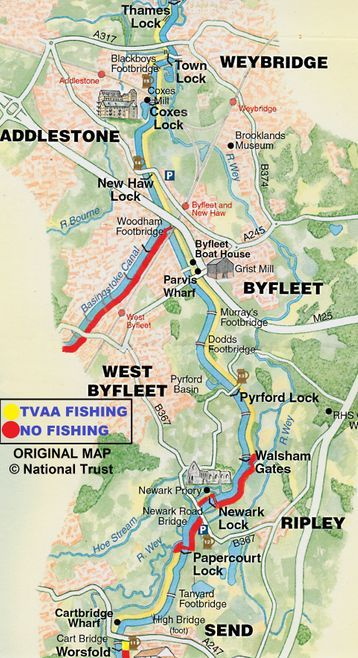 Please Note :- Each member club has its own private waters plus access to the fisheries listed below. 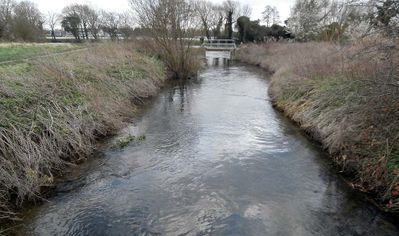 Both banks upstream from the Thames to the boundary of the Recreation Ground. Single bank then opposite the recreation ground and houses. The Recreation Ground side can be fished, but we have no jurisdiction over it. 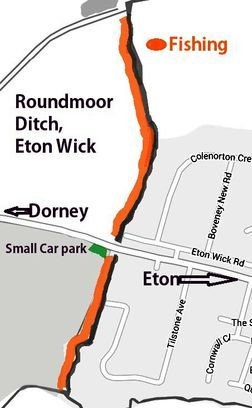 This ditch joins up with the Roundmoor, for access see the Roundmoor map. Park in the recreation ground car park near Eton Wick football club. Walk down the public footpath which runs parallel to the stream across the field. There are two bridges across the stream close to the Thames. One of these allows access to the opposite bank. 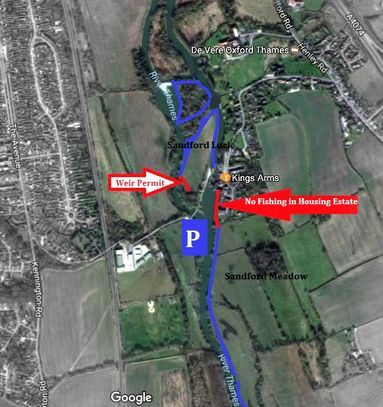 With the kind permission of Littlemore Angling Society, TVAA anglers can now fish their stretch at Sandford, Oxon. Do not fish below the lock in Sandford Mill Estate, fishing begins in the meadows. Close ALL gates after you and LEAVE NO LITTER. No parking at the Kings Arms PH, Sandford. Park in the village or on the opposite bank at Sandford Lane, Kennington (access across the bridge to the islands). This fishery will be closed occasionally for Littlemore AS club matches. See the Littlemore web page for dates. From My Lady Ferry downstream to Islet Road. 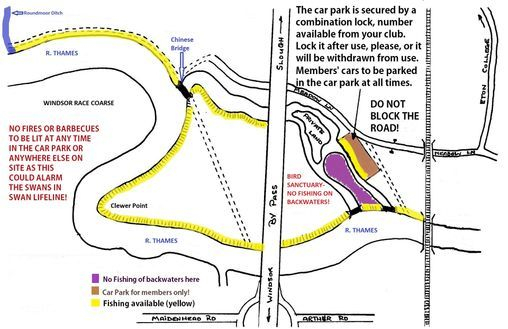 Park in Islet Road or public car park at Boulter’s Lock. 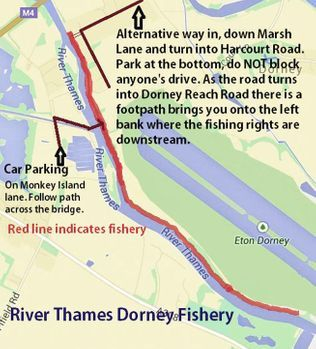 From Monkey Island Lane downstream to The Thames. Park in public car park off Marsh Lane. Thames Valley Petfood Supplies Ltd, 74 Eastfield Road, Burnham. Environment Agency staff assisted by TVAA members repairing anglers platforms on the Jubilee River. From yacht marina upstream to approx. 400m beyond the railway bridge. 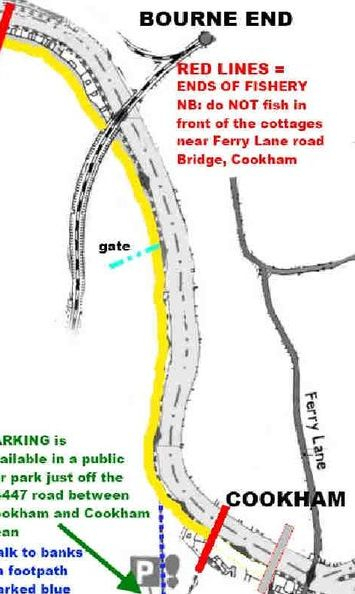 Park in public car park off B4447 or limited parking in roads in Bourne End and walk across bridge to fishery. Night fishing is permitted on this fishery. 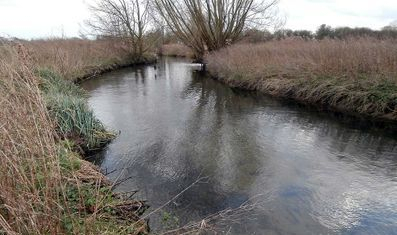 If you fish in front of the houses at the upstream end of the fishery politely inform the house owner before you begin. No fishing in front of cottages between Cookham Bridge and yacht marina. Limited parking in adjacent roads. Night fishing is permitted on this fishery. No night fishing near the house boats, please keep quiet. 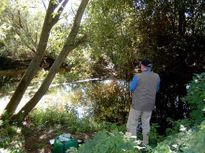 All TVAA members fish this water as guests of the Complete Tanglers angling club. From Worsfold Gates at Send to Papercourt Lock and Walsham Lock to Weybridge. Approximately 7 miles in total. 9. Do not fish within 50 metres either side of any lock prior to 1st October in every season. 11. No livebaiting for Pike etc. 12. You must produce your club membership card if asked by National Trust staff. 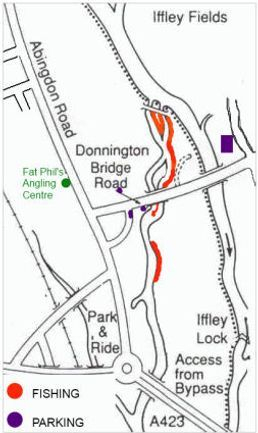 As indicated on map and in geographical order starting at Weybridge and going upstream, ending at Send. Addlestone Rd, KT15 2RX, Park on bridge (DO NOT BLOCK Farmers access across bridge) and on edge of road. Bourneside Rd KT15 2JX, Park in Parking bays, DO NOT BLOCK Residents access. 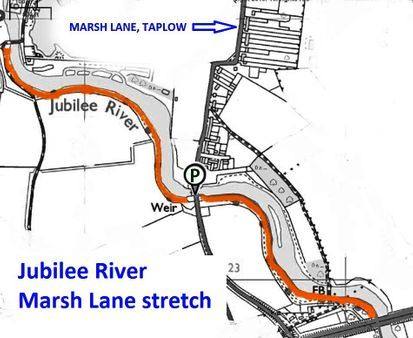 Byfleet Rd, KT15 3JX, Park in service road parallel to canal. Tannery Lane, GU23 7EF, plenty of parking in carpark. Broadmead lane, GU23 7AE, Limited parking on roadside, DO NOT BLOCK residents access. Thanks to Dave Blackmore for this information. Association members only locked car park off Meadow Lane. Lock number available from association clubs. Do not block the road as 24 hour access required by others. No fishing near the bird sanctuary. See map for more information. Some areas have been fenced off for safety reasons. Do not fish here. Parking in lay bye off Monkey Island lane, walk over bridge. Alternatively at the end of Harcourt Road, do not obstruct drive entrances. 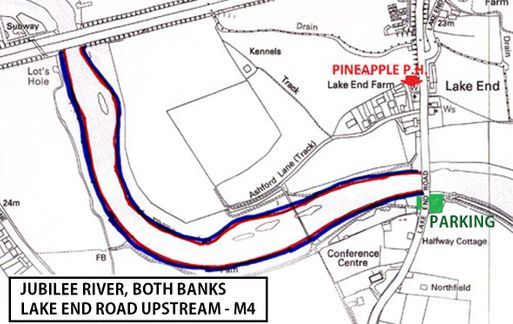 Both banks from M4 downstream to Lake End Road. Parking in car park off Lake End Road. Very limited parking in car park on Dorney Common. Alternatively in adjacent streets where parking restrictions allow. Day tickets are not available for this fishery. Anglers found on this fishery without their membership card will be asked to leave.